Caveat emptor. Nobody embodies this principle more fully than Maureen Downey, the world’s foremost expert in counterfeit wines, founder of Chai Consulting LLC and Winefraud.com. 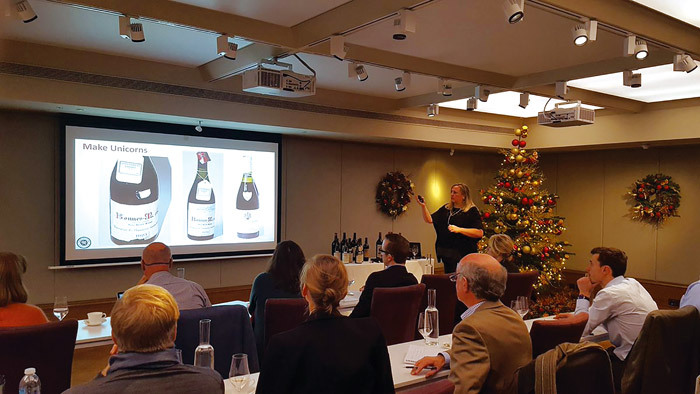 Downey and her team were in London in early December to hold the world’s first wine-fraud and counterfeit-wine authentication classes for professionals and collectors. (The same presentations and courses were held in Hong Kong in February 2017.) With a long track record in fine-wine authentication, Downey honed her skills to become an established expert in counterfeit wine and has worked closely with the US Department of Justice and FBI in numerous wine-fraud cases. Her expertise has helped bring many guilty parties to book. The ubiquity of wine fraud has turned Downey into the most outspoken voice on counterfeit wine. She is on a crusade - to stamp out not only illegal practices but also the often staggering (or even willful?) ignorance of those engaged in the legal and respectable side of the trade. Downey’s main presentation, however, focused on the burgeoning amount of fakery in the secondary fine-wine market - where most money is made - and was peppered with shocking examples of brazen criminal behavior. According to Downey’s estimates, 20 percent of all fine wine traded is counterfeit, the proportion significantly higher for some retailers and auction houses than for others. She mentioned the pictures that went around the world of the fake wines seized in the Kurniawan case and destroyed in a junkyard - but, she warned, these were only the bottles that were seized; most of what he sold is still out there, being bought and sold, as are thousands of fakes brought into circulation by the convicted Belgian merchant Khaled Rouabah. She also cited instances of collectors who discovered they had been sold fakes and sold them on to recoup their cash. “Tasting,” said Downey emphatically, “is the least valid way of evaluating a wine. Every time you read ‘extremely youthful for its age,’ it signals that the wine may well be a counterfeit,” she said, making clear that many of the existing tasting notes for legendary old wines were based on fakes and, in turn, serve as “recipes” for faking. “Does anybody know what these wines taste of?” she asked. Her method of authentication thus focuses on hard forensics. She presented many examples of side-by-side comparisons of originals and fakes. The photograph of a fake 2013 Georges Roumier Chambolle- Musigny Les Amoureuses clearly showed the vintage stated in a much thickerframed box on the label—but without an original with which to compare it side by side, would you know? On a 2010 Dugat-Py the giveaway is an uneven cutout of the neck label: “Poorly cut-out neck tags is not something quality producers do,” Downey noted. But her immense experience of looking at thousands of bottles also allows her to detect less obvious signs. She knows when a glass color is wrong, when the paper of a label does not feel right, or when a capsule looks too pristine. Then there is the problem of refilled bottles. Downey showed photos of the same refilled bottle of Cheval Blanc turning up at a tasting in Burgundy in 2012 and again in South Africa in 2013. Its label is clearly torn in the same places. According to Downey, certain bottles turn up again and again. She urges restaurants to destroy empties—but there also are stories of sommeliers spiriting empties away in order to sell them at lucrative prices. So-called unicorns are another aspect of fakes; these are wines that never existed, like Ponsot-bottlings by the French merchant Nicolas, or magnums of 1945 Domaine de la Romanée-Conti. “I have touched more large-format DRC than was ever made,” Downey joked, before delving further into her trademarked authentication process and pointing out the mistakes counterfeiters make. “There are only about 30 SKUs [stock-keeping units] that we are dealing with,” Downey said, showing a slide with the names of the usual suspects: the five first growths of the Left Bank, the stars of the Right Bank, the “La-Las” of the Northern Rhône, and a handful of very exclusive Burgundy domaines. Italy is represented only by Sassicaia, Ornellaia, Soldera, Gaja, and Giacosa. When talking about measures these producers take to counter fakes, she was critical of RFID chips, which can peel off and be faked themselves. Downey’s newly launched Chai Wine Vault database, which she has developed together with Everledger, uses a blockchain system and stores more than 90 data points of a wine, including its bottle, label, glass, capsule, and cork, to “create a unique digital thumbprint.” Everledger originally developed an authentication system for diamonds whose value, just like wine, relies not only on authenticity but also on provenance. It is a tool that can “create a complete audit trail” and ensure transparency in an otherwise rather murky secondary market. After a brief lunch break, everyone was able to start sleuthing for themselves. Some of the producers’ more recent anti-fraud measures became apparent. Downey and her team brought a wide selection of fakes and a few originals against which we could compare them. Armed with a jeweler’s loupe and blue-light torches, it became much easier to spot the fakes. The wisdom of “touching stuff” became clear, too. An amazing tool in Downey’s work is Supereyes, a handheld digital microscope connected via USB to a laptop - surprisingly good value and an investment all brokers should make. It magnifies the label to such a degree that fakes become easy to spot. The green font used for “APPELLATION ROMANÉE-CONTI CONTÔLÉE” on the fake bottle was mottled and fuzzy, whereas the original was solidly colored and perfectly sharp. The difference in print quality between home-computer printed or color-copied labels and the real thing was striking. Magnified by Supereyes, the micro-lettering incorporated into the label of a firstgrowth château’s label become clearly legible while remaining invisible to the naked eye. Another oft-copied label sparkled under blue light, whereas the fake remained matt. These are just some of the ways in which producers mark originals that are not obvious to fakers. The entire exercise showed that there is a huge range of fakes - some amateurish; others very, very good. Another attendee, Laurie Matheson of Parisian auction house Artcurial, was equally aware of the amount of fake wine circulating in the secondary market. She highlighted the problem of ensuring provenance in wine: “It’s a very complex world; it’s not like a fake painting of which there is one original. Depending on the château, there can be thousands of bottles and there are always multiple sources.” What will she take away from this class? “I am definitely going to buy a blue light and Supereyes, and I am going to be even more modest,” she replied. What prevents Lamb from highlighting these obvious counterfeits to the police? “It’s not clear to me that he [the broker] knows they’re frauds. It’s not clear to me that he’s informed enough even to know what to look for. So, I don’t really have a basis for doing that. The best thing for me to do is not to give him any business and to tell other people to be highly skeptical. He does not have the bottles; all he’s got is pictures.” So far, Berry Bros & Rudd in London is the only retailer that has had a team trained. Philip Moulin, of its fine-wine department, is now a certified authenticator and wise to counterfeiters’ tricks. Downey concluded, “I hope this has opened your eyes a little. Counterfeiting is not something that started with Hardy Rodenstock and ended with Rudy Kurniawan. There should be more outrage on this from all of us.” She has made many enemies and has even been assaulted, but she refuses to pipe down. “The problem is that more criminals are seeing the benefits of wine fraud. It’s highly lucrative and relatively low risk. They can make just as much money selling counterfeit wine as selling drugs, and if they get caught they don’t spend nearly as much time in jail. At the end of the day, it’s a good business to be in if you’re a crook,” she explained. Part of going public with so much of her trademarked material now is to raise awareness and get more people certified as authenticators, so the Chai Wine Vault database becomes viable. But there is more to this than business. It’s a deepseated sense of justice that motivates Downey: “I don’t understand why more people aren’t more upset about it and why people continue to give business to vendors who have sold counterfeit and stolen wine and have done so much damage to the industry. So many people beat about the bush that someone has to be honest with our industry.” The question looming large is why the classroom was not bursting with representatives of every fine-wine retailer, broker, and auction house.